A mysterious floating ice disk in Maine has people drawing comparisons with the Season 8 ice ball teaser for Fortnite. 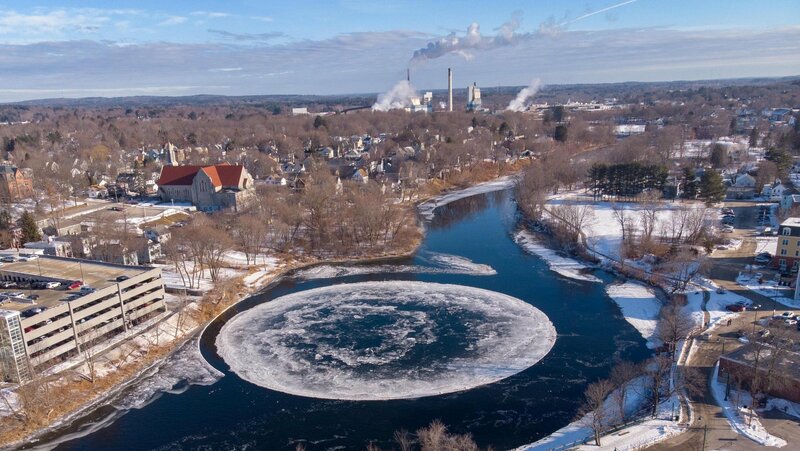 A mysterious floating ice disk has appeared on the Presumpscot River in Westbrook, Maine that’s eerily reminiscent of the Season 8 ice ball teaser in Fortnite. While the two ice formations are completely unrelated to one another, they do share one thing in common in that no one seems to know what they mean. An ice disk has appeared in Westbrook, Maine that's reminiscent of the ice ball over Polar Peak in Fortnite. Speaking with NEWS CENTER Maine on the ice disk anomaly, Westbrook city councilor Gary Rairdon said, “I have not seen anything like this. I’ve lived probably 52 years of my life in Westbrook.” Attempting to make sense of the phenomenon, it’s suggested that the ice disk formed due a variation in river depth where the shallow left side of the Presumpscot River froze before the deeper right edge. With the right side unfrozen, the river current began to shape the ice on the left bank. This natural shaping process created the circular ice disk seen in the video below, which has since altered the river’s current, causing it to appear as though it’s “spinning” in place. Meanwhile, another inexplicable ice ball in Fortnite has gamers engaging in similar speculation over how its sudden appearance ties in with the upcoming release of Season 8. The spherical ice ball hovering over Polar Peak seems to suggest a continuation to the wintery theme of Fortnite Season 7, though no further information has been provided by Epic Games. Other information points to an Ice King summoning the aforementioned ice storm, and even a Tier-100 Ice King skin potentially being rewarded to those who complete event requirements. All of these suggestions seem plausible, though we’ll have to wait a few more weeks for the launch of Fortnite Season 8 to find out. Until then, you can visit the ice ball near Polar Peak in Fortnite, and if you live in Maine, you can also visit the ice disk that’s currently floating on the Presumpscot River in Westbrook. We have no idea what either of these mean, all we know is that they’re both truly mesmerizing to look at. In the meantime, what do you think of the Maine ice disk and the Season 8 ice ball teaser in Fortnite? Let us know down in the comments below!